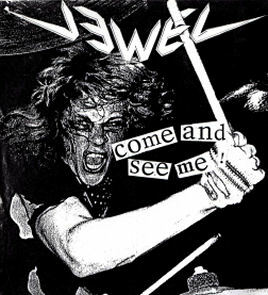 BIOGRAPHY: The band who used to be Sword changed their name into Jewel in mid ’86. This because of the many bands around called Sword from which the Canadian one is the most famous. 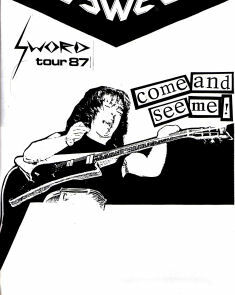 Under the name Sword the band recorded an LP which the band which takes a lot of time to release ending with no release at all. This leads to problems within the band and results in the departure of singer Peter Ort. Replacement is ex Chinee singer Rick Ambrose. With Rick in the ranks the music gets heavier and heavier in a style which is hard to define. When people ask what style the band is playing the band invents a name for it, ‘Classic Thrash’. 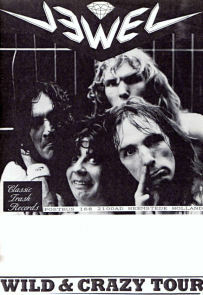 The band also advertise with slogans like ‘The Wildest Band in Heavy Land’. In ’87 the band takes part in the ‘Grote Prijs van Nederland’, a talent scout. The band reaches the semi finals, but it doesn’t result into something more for the band, but heir fanatic manager, Frank Misset, does arrange a lot of gigs for the band. 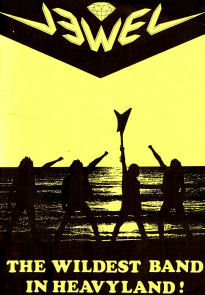 That results that in ’88 the band plays the most gigs of all bands (together with Vengeance). 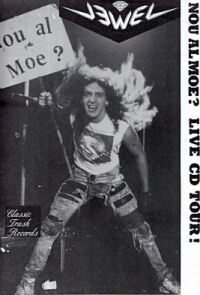 During their gigs people can buy the live demo ‘La Morta Live’, recorded by the NOS (the national radio/tv network, the Dutch BBC so to speak). With the many gigs the band does, the tape sells very well, and soon 1000 copies are sold. The band convince many fans, but still the labels are silent when it comes to a record deal. 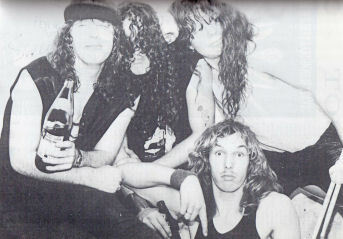 Soon after all the touring Frankie Woodhouse, who was the drummer for while during the Sword period, returns as drummer. With him in the band plans are made for a mini-LP. ‘If the labels show no interest, we might as well release it ourselves’ is the idea behind it after a short flirt with CBS. For the mini LP the band takes a few old Sword songs and change it here and there. At the end of ’88 the mini LP ‘La Morta’ is released. Old Sword song ‘The Spy’ is now called ‘La Morta’ and sounds a lot more heavier than the old version. The reviews are very good and attracts interest from the pop group Slauerhoff. The band has good contacts in the Soviet Union and asks the band for a tour through Georgia. A opportunity that the band grabs with both hands. In the 1st half of August ’89 the tour starts. The band does 12 gigs in 3 weeks in front of thousands of metalheads who were hungry for metal. In Holland singer Rick gets his own Tv program on the VPRO network. The program is called ‘Rick’s Muziekhoekje’ (Rick’s Music Corner). Of course Jewel appears on the show too. Early November, we’re still in ’89, the band does a gig in the famous Melkweg in Amsterdam with the Russian legends Kruiz. The gig is attended by many European booking agents, but again, it doesn’t have any real result. e of the Heavy Metal Maniacs compilation CD, with a song from Sword on it, Henk appears on stage at the CD release party in 2004, playing the song with the help of Conquestador. Bass player Wim Smits joins after Jewel symphonic metal band Zarathustra. Drummer Henk Mulder becomes a drum teacher in Amsterdam while other drummer Frankie Woodhouse plays in several bands of which his Van Halen cover band ‘Hot For Teacher’ is quite known in the country. Super party’s everytime they played. Real super music. It’s a shame they didn’t break through. Still searching material of them. 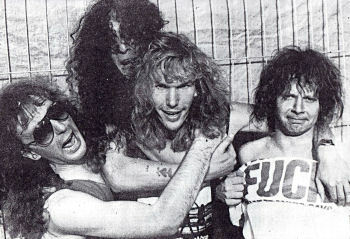 Greatest Dutch metal band ever!!!!!!!! !